Arugula is a cool season, fast growing annual that has been harvested in Europe for centuries, both in gardens and from the wild. 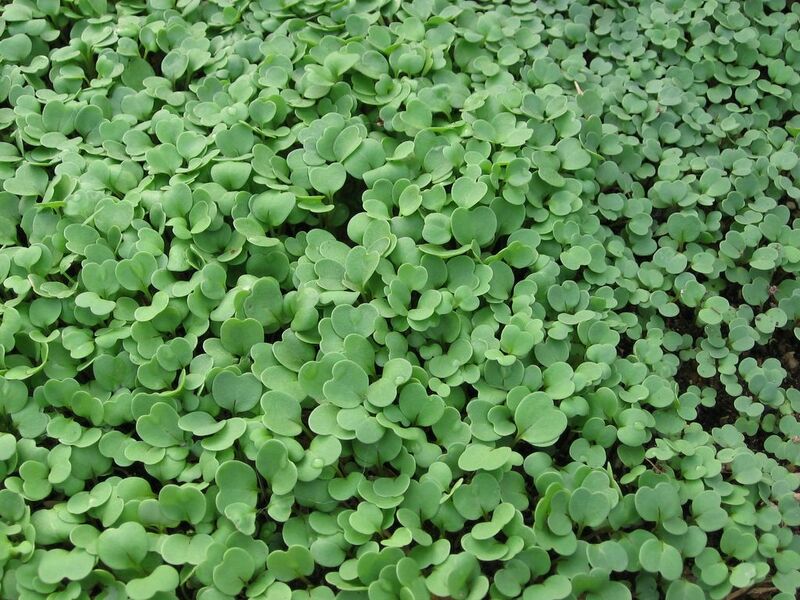 Its dark green, aromatic leaves boast a strong, peppery flavor that is both spicy and nutty. It's wonderful in salads but can be used in all sorts of other ways as well, like made into pesto or added to this scrumptious Roasted Leek and Potato Soup. This quick and easy All Purpose Arugula Cottage Cheese Dip/Spread/Sauce is a delicious (and healthy!) way to enjoy a bountiful harvest. The arugula sold at farmers' markets or grocery stores is usually just labeled 'arugula,' 'baby arugula,' or 'wild arugula,' but there are actually several varieties of it. Wild arugula generally has smaller leaves and a stronger flavor, though what you find for sale isn't actually wild, but has been grown under cultivation. Some arugula has such a peppery bite that people use it more like a fresh herb, adding just a little bit to dishes. Warm weather usually intensifies arugula's flavor. 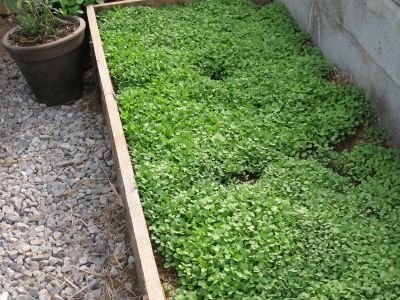 Several people have asked me recently for some tips on growing lettuce from seed. 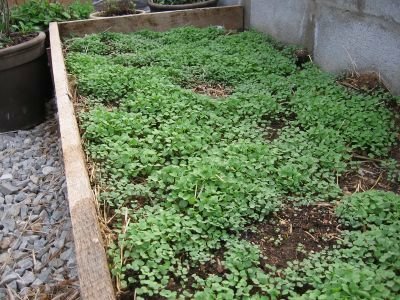 I answered them individually (and all are now happily watching their salad greens grow), but I thought an article on this subject might encourage others to start a little spring salad garden of their own. So I'm just going to basically repeat the advice I offered them here, with a few more tidbits tossed in. Lettuce! 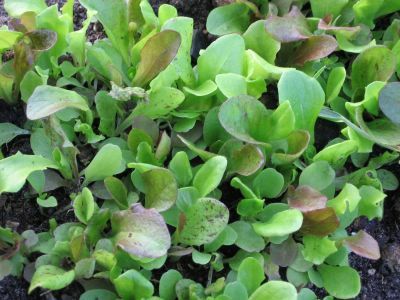 A mesclun type mix would be wonderful—that way you get several varieties of lettuce seeds in one packet. You can start harvesting after only a few weeks—just snip what you need and leave the plants to continue growing and putting on new leaves. 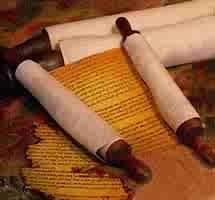 This also prolongs your harvest. 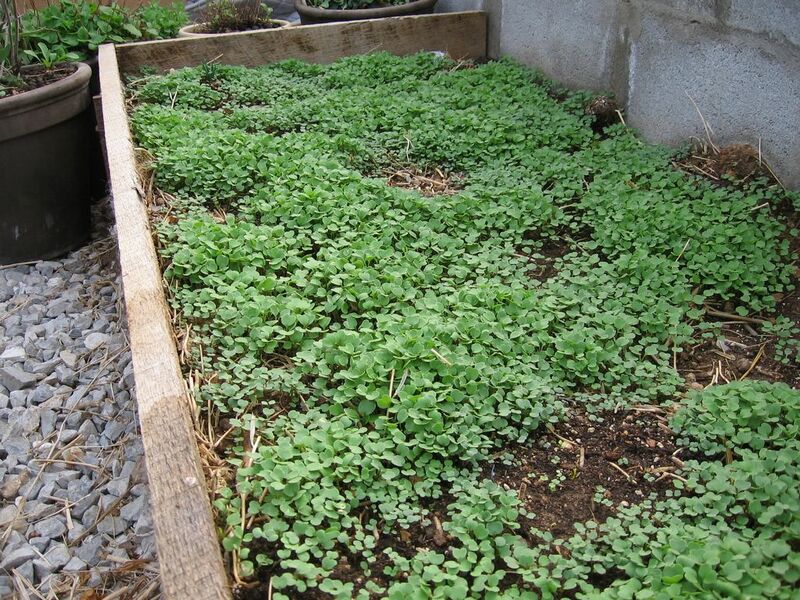 If you have sown the seeds very thickly (which is what I do because it virtually eliminates weeds), you can start thinning out your plot as soon as the plants are big enough to at least give you a leaf or two to nibble on. After several weeks, I am still at the thinning stage with my lettuce plot—I reach in, pluck out a few of the crowded plants from several different spots, and I swear by the next day the remaining plants have already filled in the empty spaces. My favorite is the Rocky Top Lettuce Salad which is full of 'brightly colored and unique lettuces, including some non-listed rare varieties.' All packets contain 1,200+ seeds and are just $2.00 to $2.50 each. 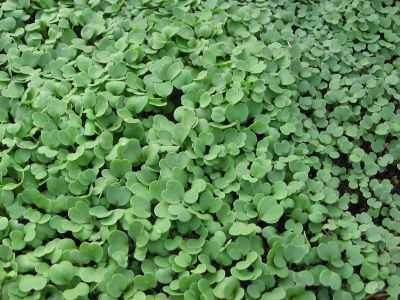 Click here to see photos of this lettuce bed from April 12th. And click here for my favorite way to enjoy freshly picked lettuce. I also explained to her that arugula (sometimes called rocket) is easy to grow from seed and ready to harvest in less than a month (as evidenced above). 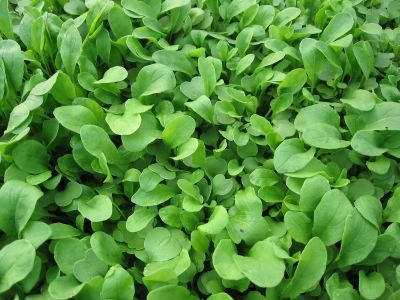 This peppery green adds a unique bite to all kinds of salads and is delicious tucked into sandwiches as well. I have such an amazing arugula crop this year, I'm going to think outside of the salad bowl and try making some arugula pesto by blending together arugula, fresh parsley (to tame it down a little), lots of fresh garlic chopped with salt (it brings out the flavor of the garlic), and some very nice extra-virgin olive oil. Tossed with some homemade pasta, then sprinkled with plenty of coarsely grated pecorino romano or parmesan cheese, and served with a garden salad, I think this would make a delightful spring supper. In fact, I may just make it tonight. Update: Arugula pesto is one of my most popular recipes! 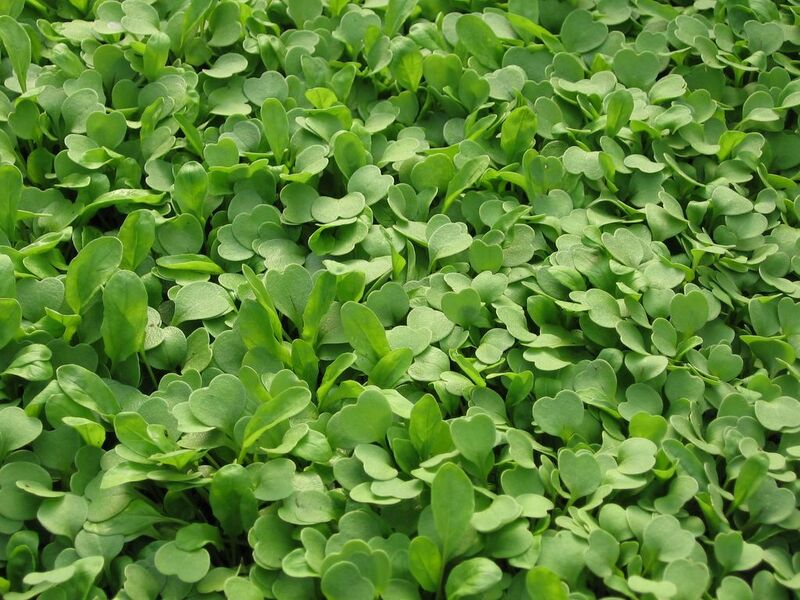 You can start picking baby arugula leaves when they are still very small. Just keep in mind that once the plants reach maturity, it doesn't take long for them to bolt and flower. But of course if you allow some of them to go to seed, your next crop will most likely sow itself. To add another kind of zip to her salads, I suggested Stacey try growing some radishes. These are easy to start from seed and are, again, ready to eat in less than a month. There are dozens of interesting heirloom varieites available, from mild to pungent, in all shapes and sizes. If you're only going to pick one, I recommend going with Easter Egg. Baker Creek describes them as a beautiful mix of colors that includes shades of purple, red, and white. Mild and delicious flavor, fun to grow, and perfect for mixed bunches of radishes. I grew them and found every word to be true. Several years ago I read an article about Chez Panisse restaurant in Berkeley, California. To this day, the only part I clearly remember about it involved a radish. Apparently one diner was slightly shocked to discover that the first course of their $75 prix fixe dinner at this incredibly famous restaurant was a plain, fresh radish served on a small plate. Then they tried it and were astounded by the flavor. Sometimes it's funny what memories stick with us. And I bet that person will never forget their first real taste of a radish. Vickie at The Moveable Feast in Virginia also wanted to know about growing lettuce in containers in areas that don't get much sunlight. Most vegetables (even tomatoes and peppers) require just 6 hours of direct sun a day. 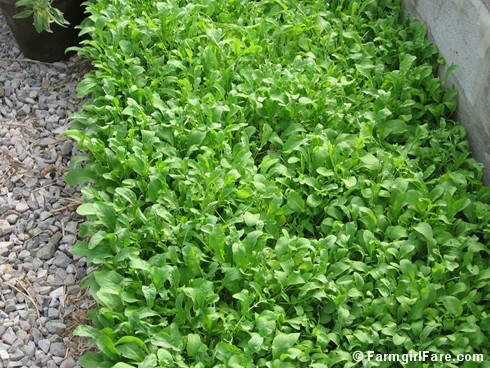 Lettuce and arugula can thrive in less than that, and they can even be grown in dappled sunlight or shade. The arugula in my greenhouse (along with the chard and beets) receives only filtered light, and, as you can see, it has flourished. You can grow lettuce and arugula in virtually any kind of containers: 5-gallon buckets, wooden wine or whiskey half-barrels, even large flower pots. 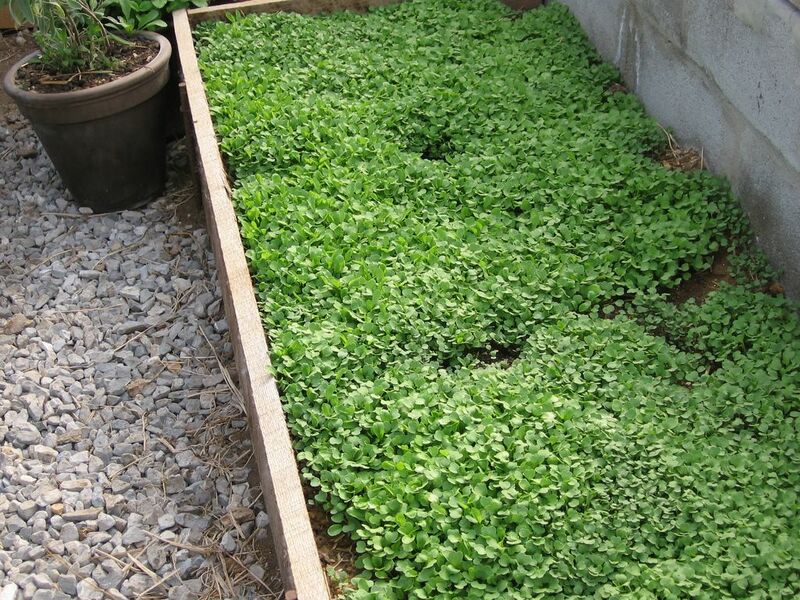 However, you don't need two feet of soil depth to grow lettuce, so something shorter and larger would be ideal, such as the plastic commercial bus tubs used in restaurants to hold dirty dishes. I even have one that has large holes in the bottom and fits into another, slightly larger tub—built-in drainage. (Look for them at restaurant supply houses.) A plastic dish tub would work, too, or even a (new) plastic cat litter box. All of these are a nice rectangular shape and should be plenty deep. And they are small enough that you can pick them up and move them around—either into or out of the sun. Remember: heat is the enemy of lettuce so you want to keep it cool. Even a few days in the upper 80s or 90s can turn your whole crop into bitter greens. They will look fine but suddenly taste terrible. This is very, very depressing. Click here to read my previous post about shading lettuce and other plants. On the other end of the thermometer, lettuce is quite cold hardy, and can even survive light frosts. I had some uncovered lettuce subjected to 24° a few weeks ago, and it thawed out just fine once the sun hit it. My pal Amy, who recently moved into a new house with a large yard and went slightly crazy with the seed catalogs, wanted to know what types of lettuce she could grow in Pensacola, Florida. To win the battle against bitter lettuce, another thing you can do is choose varieties that are on the small side, such as Tom Thumb Butterhead (one of my favorites). Again, from the Baker Creek catalog: An heirloom lettuce that dates to the 1850s. It makes small cabbage-like green heads, only 3"-4" across. Very tasty, a winner for classy markets! Also seek out varieties that say 'heat tolerant' and 'slow to bolt.' Baker Creek says that Mignonette Bronze (an 1898 heirloom I have grown and like) is excellent for hot and tropical weather and a superb type for the hot parts of the country. Little Gem delivers two for one: this very small, green, romaine-type [is] a superb heat tolerant variety that is sure to please! Baker Creek sells over two dozen varieties of lettuce in packets of 700 seeds for $1.25 to $1.50 each. Pinetree Garden Seeds (another of my favorite companies that offers much more than just super seeds) offers several kinds of lettuce (including a few of their own special mixes) in packets that contain 500 seeds for just 60 to 95 cents each. I discovered High Mowing Organic Seeds after I was already seed set this year, but I have heard good things about them from other gardeners. The same goes for Seeds From Italy. Unless you live in the Southern U.S. or other warm climate, it shouldn't be too late to start a salad garden. To sow your seeds, simply scatter them onto your freshly prepared soil and lightly work them into the dirt with your fingers or a rake. You can also sprinkle them with a light layer of soil or compost--they don't need to be covered much at all. Water well, then just sit back and wait, daydreaming of the beautiful bounty you are bringing to life. Recommended Reading: The Vegetable Gardener's Bible by Ed Smith. This has been my favorite gardening book for the past 7 years, and I highly recommend it for kitchen gardeners of all levels. Isn't it amazing how arugula keeps on producing? 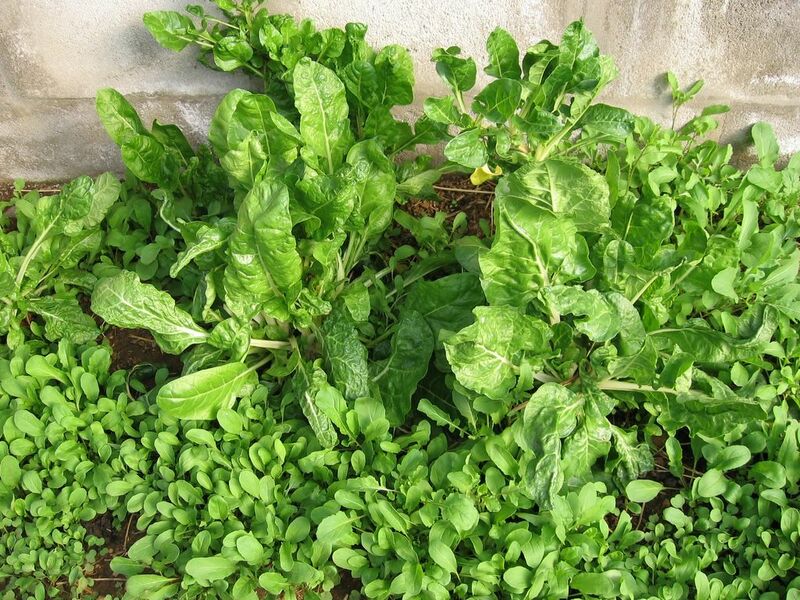 If you can find the seed, get the wild variety of arugula, what the Italians call rucola selvetica the flavor is more intense and just as productive as the regular arugula rucola colitivata. Oh and by the way... I can NEVER get GrowItalian's website load, I guess I'll just have to keep going to that garden shop in Florence for my seeds :-P.
Radishes and zinnias were my responsibility in the garden once I was big enough to walk. What a wonderful post. I haven't grown lettuce much in the past, but this year I cleared out a patch and thought I would try to grow some early lettuce, filled in with chard for later in the summer. Arugula sounds yum. Thanks for the timely post, my salad seed just showed up this morning and is being planted Monday. :) This novice gardener here needs all the help she can get! I want to let your know how much I enjoy your blog. I have been reading Farmgirl Fare for quite some time but inmykitchengarden is my favorite now. We moved to the country 13 yrs ago and had a huge garden that got smaller each year until now when we just use pots and buckets. We have tomatoes, peppers, lettuce and I just put green garlic around the peppers. My son asked if we were going to have a garden this year and I said just our pot garden, which cracked my 2 grandsons up. The sheriff will probably be out soon! Oh my. Arugula varieties. I can tell you're going to be a very bad influence (in a good/bad way of course). So are you still the radish & zinnia girl, or have you delegated those duties? Great timing! Help is here. And let us know how your salad garden grows, okay? Once your seedlings sprout a pair or two of "true leaves" (the ones that pop out first are, well, fake leaves--they have a name but it escapes me at the moment), you'll need to start putting the seedlings either into individual plugs/containers or transplant them straight into the large container you want them to grow in. P.S. People are always asking my advice on container gardening (which I don't do much of), so please feel free to offer up any great do's and don'ts you've learned over the years. I know growing larger plants like tomatoes and peppers in pots can be especially tricky. And despite your helpful suggestions, I have given up on my sad little lettuce plot. How did I screw up? A variety of ways: too much sun, too sparse plantings, and probably not enough compost/kelp, considering I have NO idea what the previous homeowners did to the soil. I console myself with the idea that while you guys are all living on hardier greens and pickled veggies this winter, I'll be enjoying (what I hope is) a bumper crop of *spring* lettuce here in zone 8!! arugula has always been my favorite green. tabitha finds it a bit spicy. maybe i need the alkaline. we encouraged some to bolt and now have an incredible amount. sometime i sneak to the garden and tear a few clumps of leaves and eat them right there--in fact, the garden is one of my favorite places to eat. I found your site last week, and have since been glued to the computer! You are charming, and your advice is such a godsend... thank you! Having just moved from the city into a neglected 1880s farmhouse, I'm finding the garden a bit intimidating! 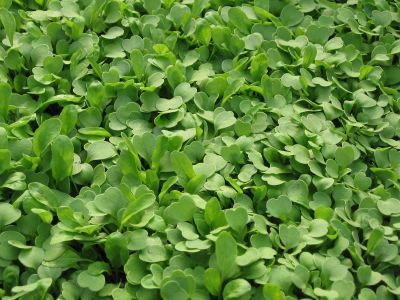 I just ordered Baker's seeds today, thanks to you, and look forward to my own crop of arugula in the future. Thanks for the daily inspiration and cheer! Thanks for this how-to post! Since I live in an apartment, I am trying to do some container vegetable gardening. I'll definitely be trying some arugula with the help of this post! 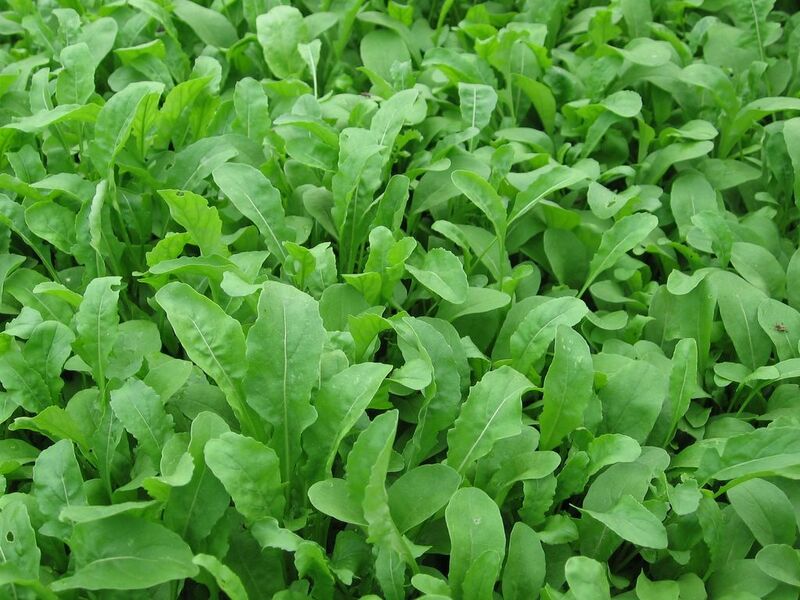 Does this arugula variety have pointy outshoots from the surface of the leaves? They look like tiny harmless clear splinters. I grew this exact variety but am hesitant to eat it because I'm not sure if those "splinters" are normal. By the way, this website is wonderful! Glad you're enjoying my site. 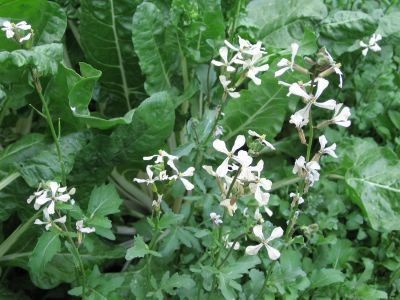 As for your arugula--I had some Red Russian kale in the garden last summer that developed bizarre pointy shoots on the surface of the leaves. Never happened before. I took some photos and intended to investigate further, but I never thought not to eat them! Oops. I was thinking they were caused by the weather, but looking back, that doesn't really seem like a logical explanation. Thanks for your blog on lettuces. I love salads. I especially love Mache but I've never succeeded in getting it to grow. When I lived in France there was a wilder version of mache called la ducette and it grew like crazy. Do you know if this variety can be found in the USA? Also, any ideas on growing mache? So glad you're enjoying my blog. I, too, love mache, though for the past several years it's somehow slipped out of my mind. Thanks for the reminder! I have successfully grown mache (also known as corn salad) in the past from seed. I think the most important thing to know about these little plants is that they prefers cold temperatures. I was surprised one year to find some popping up in my unheated greenhouse in the middle of winter--it was reseeding itself from the previous year's planting that I'd let go to seed. I'm not familiar with the different varieties and haven't heard of la ducette, but you might do a google.com search for it and see what pops up. I'd search for "la ducette" "seeds" and "mache." "Also known as cornsalad, this member of the Valerian family is very popular in France. Its fine, nutty taste enhances salads. It is very cold tolerant, so it's a great early or late season green. 60 days." Johnny Selected Seeds in Maine (another great company: http://johnnyseeds.com) offers two varieties of mache: Vit and Jade (which they say is a "Vit-type corn salad") with a 50 day growing time for both. "Specialty salad ingredient. For cool or mild weather and winter greenhouse. Avoid hot weather." "Plant Sept/Oct for spring crop; early spring for late spring crop. Germinates slowly in 10 to 14 days. Thin to 2" apart (use thinnings as 'baby mache'). Harvest entire rosette by pinching off at the root when 2-1/2" tall. Mache is bolt-resistant, but its flavor declines when overmature. "Versatile variety for growing year-round. A vigorous, mildew-resistant variety for spring and fall crops, as well as for over wintering. Long, oval, glossy green leaves form a heavy bunch with a tender, flowery, minty flavor." A mini packet of seeds is $2.75. A mini packet of Jade is $3.65. Hope this helps. Happy growing! You can probably sow your mache seeds outdoors anytime in the next month--they should germinate despite the still cool temperatures. That will give you a late spring crop. Then sow seeds again in late summer or early fall--as soon as it starts too cool down--for an early winter crop. You might want to make successive plantings, meaning you soo a new little patch of seeds every week or two. That way your entire crop won't be ready at once. When I started reading your blog (which I enjoy daily!) I saw the post about your arugula. I live in SW Florida, and I thought "hey, maybe I can do that!" Well, the experiment has commenced, and it was SUCH fun seeing (for the first time!) the mesclun sprouts coming up. I'm watching the progress each day...it's amazing how fast it grows. I got flats and box tops that folks were discarding and am using those, even though they're only a few inches deep. Hopefully that is deep enough?? So far it's in the 80s right now, but in shady areas that only get a bit of sun at certain times of day, hopefully I won't kill off the little greens. It's so great being able to see your pictures and descriptions because it makes it clear that yes, maybe even I can do this, too! I actually tried REAL pesto for the first time ever the ohter day...can't wait to try making it from arugula! Your blog has given me the inspiration to try growing my own arugula from seed. I've already got some that has bolted that I bought at the local market and I'm wondering when I'm supposed to pick the seeds and even what they look like. If it has flowered, am I too late? Thanks for the tips on container gardening. I used to have a garden outside and it's been a challenge to find good information on how I could grow some of my favorite things in containers in my apartment. Any and all information on *indoor* vegetable gardening is much appreciated by me! Some containers that I recently discovered are "Mud-tubs" bought at Home-Depot (Really sturdy and about 26" X 20" X 6" and cost about $6). In LOWES I found the same sized tub (a little lighter weight material) for less than $5), Also Lowes had what they called the super Tub (36" X 24" X 8") for less than $9. I would think that these sizes would be suitable for leaf lettice, smaller herbs and red radishes. A quick search on the web will produce details on making your own self watering containers that are great for tomatoes. As an after thought, tomatoes do quite well growing from a hole in the bottom of a hanging 5 gallon bucket. I enjoy eating fresh tomatoes without ever leaving my deck or upon arriving home after a days work. The pots are never taking up valuable floor space or gathering trash behind them from the wind. I'm a Northern California girl, spoiled by the long summers & endless supply of beautiful produce, who has moved to the east side of the Rocky Mountain foothills. Oh what a fish outta water I am... gasp. So over the years I am trying to produce the produce on my own in Zone 1-2. What a challenge it is. So much of the wonderful information you give is lost to me due to the impossibly short summer season here in this quasi-desert I call my home & garden. Now I totally understand the need for all those green tomato recipes! I never got that before! Anyone else in my situation? Please reply. We can start a support group on here! You, me & the earth worms, we can do it! I love arugula pesto!!! try it with meat it is to die for! I did it once with arugula I bought at the supermarket (expensive!) I started growing last month and it is so easy, and I live in the "3rd floor :-) Why didn't I did it before? I eat fresh delicious salad everyday! I've never grown lettuces this close together before. I must try it!! So the weather would have to be temperate more or less for arugula and lettuce to grow right? I'm checking because I really want to grow my own salad leaves and I live in India- not in the hottest part of it but a city with a more mild weather. But would this be impossible to grow during summer? 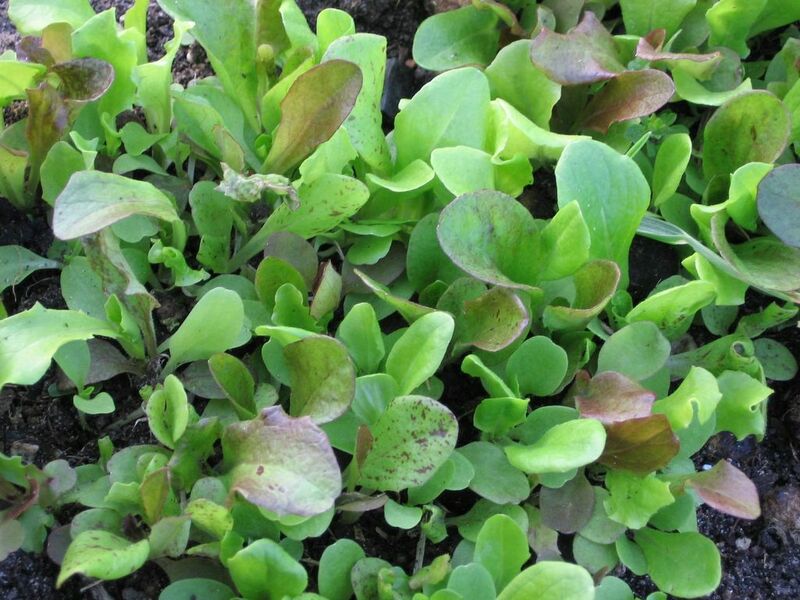 Arugula and lettuce both prefer cooler temperatures. Lettuce seeds won't even germinate if the soil is above 72°F. 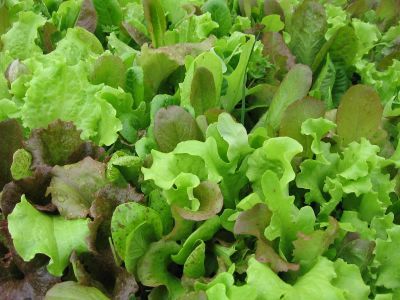 Growing in a mostly shaded spot can help, and with lettuce you can seek out varieties that are heat resistant and slow to bolt. I just spent 4 months in Hawaii - day time temps in the mid to upper 80's. Nights in the 60's. Blazing hot sun in the afternoons on the arugula patch. The arugula got watered every night for about 20 minutes with the automatic sprinkler system. That arugula just kept putting out leaves and more leaves. I snipped bagfuls for my friends - all they could eat. The plants were about 18 inches tall, and a foot in diameter. I searched online for "arugula recipes" and "arugula health benefits". I used the arugula in salads, on sandwiches, stir fried, mixed into rice and oatmeal (yes, oatmeal!). I took some camping - it lasts 3 days outside of refrigeration in a plastic bag with some wet paper towels. I love reading your blogs and other people's comments, using your recipes, and getting a great jolt of realness. Thank you--helps me remember as I teach h.s. in north St. Louis county that there is real life out there. Real growing, mistake making, tasty, funny, hard work that makes a person whole. Your blogs and photos make you seem like a good friend--thanks for giving this to all of us "followers"!!!! With gratitude, Nance C.
You're very welcome. And your kind words made my day. You inspired me to start an arugula container. I didn't know they were easy to plant. I'm in South Florida and it's in the mid-60s to 70s right now so they should sprout, right?